By the grace of God, J.E.B. Spredemann resides in beautiful sunny California and writes Christian fiction. We hope our books uplift you, inspire you, make you laugh, and touch your heart. To God alone be the glory! Hannah, Samuel, and Christian were best friends. Hannah and Christian married and stayed in their little Amish community, and Samuel moved to another community to marry his love. But Hannah had a secret, and no one could ever know her secret because it would upset the lives of too many people. She had a wonderful marriage with her husband Christian, and hopefully one day they would have a house full of children. But despite everything, Hannah was always plagued with the secret that she carried all alone. And no way could this secret ever come to the surface, or could it? The Bible says to be sure your sins will find you out, but they really wouldn’t if she never told anyone. 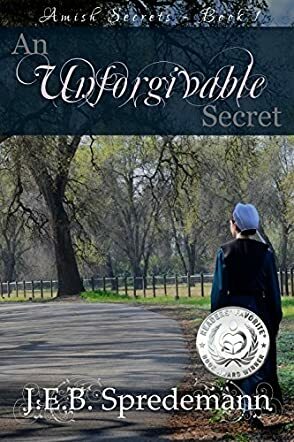 An Unforgivable Secret was an intriguing, interesting, and sometimes heartbreaking story. There is a lot going on with two communities, the lives of Englischers and Amish young people woven together, giving the Amish a taste of what it is like living outside their family and their Amish community. There are a lot of twists and turns here, too, and Ms. Spredemann does a wonderful job of showing how Amish youth can suffer for a lifetime just by the bad choices they make while in their Rumspringa times. I appreciate the way she weaves love, repentance, faith, and forgiveness into the lives of the characters in this book. And the beauty of it was that although so many people were hurt from those bad choices, because of their faith and trust in God, their relationships were stronger than ever. I highly recommend An Unforgivable Secret to those who enjoy Christian fiction and Amish fiction.